For this week’s Treasure Chest Thursday, I’m looking at a large clipping from the Donna Darling Collection. Initially, it covered two pages in the scrapbook. I was able to take the two pages, crop them, then join them together using Photoshop Elements. The seam between the two images isn’t too bad. Handwriting at the top of the page indicates, “Phoenix Ariz. Sept 30 – Oct 1-2-3. 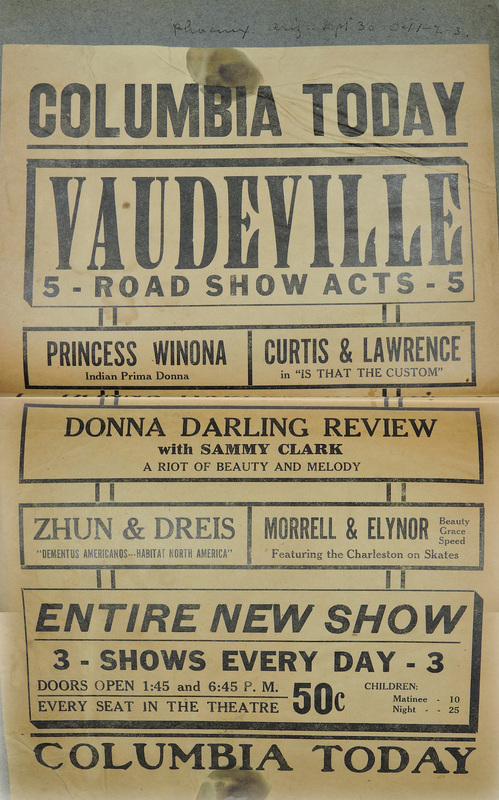 During my recent research using Newspapers.Com, I learned that Donna and Sammy played at the Columbia Theater in Phoenix, Arizona, September 30th thru October 3rd, 1926. Now I can put these images with my newspaper images and write about the show sometime in the future. Donna Darling Revue with Sammy Clark.